Kaushika, a young man, wanted to go off to a hermitage to study the vedas. His old parents requested him to stay back and look after them. But Kaushika left his parents and went away. In due course he mastered the Vedas and became a saint. One day, some bird droppings fell on him. Furious, Kaushika shot a fiery gaze and burnt the bird to ashes. Then he went out asking for alms. A lady busy with her chores asked him to wait. Kaushika felt insulted and cursed her. she replied that a saint should control his anger and not kill animals. She also suggested that he should meet the holy Dharmavyadha in Mathura and learn about virtue. 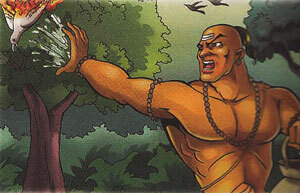 Kaushika rushed to Mathura, but when he reached there he found Dharmavyadha running a butcher shop. He wondered how a holy man could butcher animals. Dharmavyadha reminded him of the bird he killed and added that he was merely doing his duty of carrying on the family trade. He said that a farmer who tills the land also tramples insects unknowingly. After the Dharmavyadha introduced his family. He said it gave him great pleasure to serve his parents and fulfill the duties of a father . Kaushika realised his mistake and felt ashamed that he had ignored his duty. He understood that that the true virtue of man lies in carrying out one's dharma or task . He thanked Dharmavydha and rushed back to his old parents. His parents were delighted to have him back .